I stumbled across Autodesk Remote on the Autodesk Exchange | Apps today. I recall reading about Project Blink back in June on Shaan’s blog, but lost interest when I found out that it was only available in the US. This interest was briefly renewed when the Project Blink Beta graduated as Autodesk Remote back in July, until I read the line “Autodesk Remote currently works in North-America only”. So imagine my surprise when I came across it on Autodesk Exchange today and that line was missing! A quick Google turned up a post on In the Fold, Autodesk Remote Goes Global. So it’s official then. 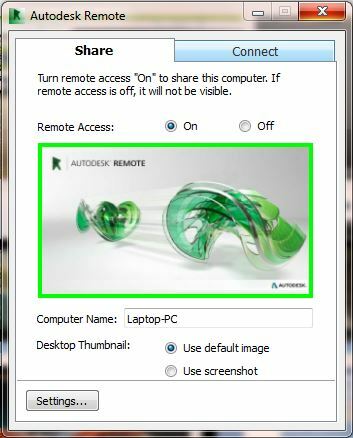 For those who aren’t aware (as if the title wasn’t enough of a give away), Remote allows you to install the app on any PC that has Autodesk software on it and then log in remotely from another PC with the App installed. You can essentially work from a remote location on your workstation, and it’s not limited to just Autodesk software either. Note that subscription is required to be able to download and use the app. You can read more in the links above. Working from wherever you want not only gives you a betterRevit, but hopefully a better lifestyle! It’s just another Remote Desktop solution, and it’s not the best one. Tried it and compared with similar solutions, it’s sloooooooooooooooooooooooow. Removed it right away. Don’t bother it. Better try a VNC-like solution. Plenty of them around for all platforms.